Totally integrated cooling core with a single fan for the entire system. Scroll through the animation - they are packing a lot into the cylinder, and the cooling is the starting point of the design. The single top fan is a neat idea but is it practical for such a high end setup considering there are no dedicated heat sinks/fans...Any heat pipes in that center cavity? Where is the PSU anyway? Did Intel design the form factor? What kind of limb is Apple going out on this time? Will all desktops look like this until all-in-ones take over. Questions to ponder.. The single top fan is a neat idea but is it practical for such a high end setup considering there are no dedicated heat sinks/fans...Any heat pipes in that center cavity? The primary structure is a big honking aluminum heatsink in the shape of a vertical triangular tube. The mobo connects to one side, the GPU to the next, etc. I'm guessing there are heatpipe style interfaces between the CPU and the heatsink, etc. Air comes in the bottom, goes up the tube and out the top. While it's a neat looking thing, it does take away the whole expandability advantage of a desktop. Direct contact between the heatsink and the face of the chips is even better than heat pipes. The heatsink extrusion has very low air resistance, and it is exactly the right format for natural thermal chimney. My guess is that the the power supply is at the bottom. I think the hard drive is parallel with the flash drive which is just outside the pin side of the CPU. I agree that the lack of expandability is the first obvious issue; but as I went through the list of features, I wonder what you *could* expand? It will have up to 12 cores (on a single chip?) and it has dual GPU's and the motherboard bus and the memory channels and the I/O ports and the wireless, with much higher bandwidth than almost anything available today. I suppose you are right. Here's hoping that thunderbolt finally takes to the market and the interfaces do not become antiquated soon. Does it require special graphics card ect. to interface with the vertical heat sink. If so, probably no off-the-shelf upgrades. You can use thunderbolt ports for "external" expandability though. Though dual gfx cards are enough for me, you can add more with modular graphics card cases like this. I think it will take multiple thunderbolt connections. What do you think of "modular expandability"? i thought direct contact heatpipes were the "best"
what is the best haswell heatpipe cooler in 2013? no heatpipes at all is better than heatpipes. My thermodynamics lessons date back a while, but the phase change of water does take away a huge amount of energy. Do you think a chunk of Cu/Al is better due to faster heat conductivity? The liquid changes phase TWICE inside the heatpipe. During one of those changes it absorbs heat (when it's near the heat source), and during the other change it emits heat (when it's near the heat sink). The heatpipe is merely a transport mechanism. The heat has to go somewhere, which in every case is the air that surrounds us, and the heat sink/water-cooled radiator is the device that achieves that result. Energy is neither created nor destroyed, only transformed. Why thank you Dr Rotor for enlightening me on the first axiom, but that doesn't really address the issue in question. We're probably wandering way off topic as well. The interface between materials is the "weak link" in any heatsink system - the Mac Pro has just one thermal connection. Heatpipes are good at moving heat from a small area to a large one, but there are FIVE points of transfer in any heatpipe system. (Chip to contact plate, plate to heatpipe, inside heatpipe to liquid, gas to inside of other end of heatpipe, then heatpipe to fins.) And the Mac Pro has the ability to directly connect a large area to the CPU and GPU's; so heatpipes are not needed, and they in fact would hinder things. 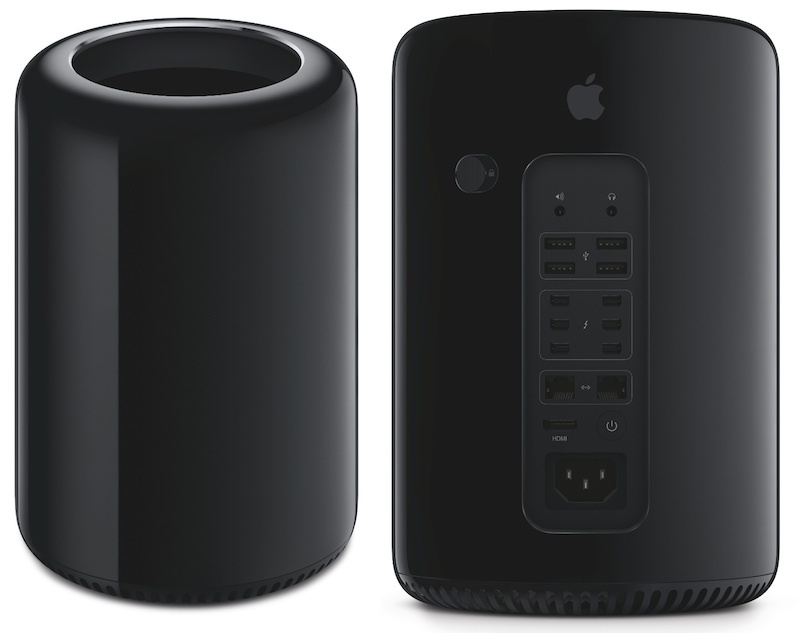 I'm hoping the price on the Mac Pro is not astronomical - hopefully since it is compact and uses a fraction (1/8th?) of the materials of the current generation, this will translate to a lower cost, too. ive yet to see any apple device that was not absurdly priced...even their simple charging dongles are outrageous. i would be truly shocked if this thing is any different. I think any cost savings on the case design will be minimal compared to the cost of the electronics therein. That said, there's potential for lower mfg cost on the GPU side as Apple is just buying the chips from AMD and not boards. I don't know how big the Apple Tax will be. I can't imagine this being a quiet machine. No matter what type of heatsink they use, at the end, you have two FirePros and one 12-core Xeon dumping their heat in the case. Apple will probably mitigate some of this by using low power chips. Nonetheless, when stressed, I'd reckon more than 100 watts of heat energy need to be evacuated. The reason multiple big fans are the silent choice is that they move the same amount of air at lower air speeds. And wind noise is the primary source of noise of a good fan. So this one Mac Pro fan will have to move air quite quickly, resulting in the tyical whoosh-noise. 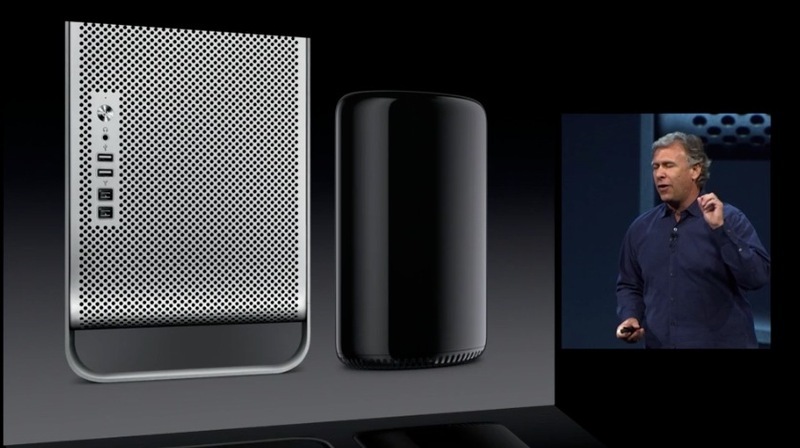 But the real problem: this Mac Pro is designed to be ON YOUR DESK. So the noise will occur 2-3 feet away from you, directed upwards. Apart from that: Apple designed a machine that, while a technological marvel, is not really what their pro users wanted from them. No expendability, no internal drive bays. If it works out, kudos, but this seems to be the second coming of the Cube, one of the bigger flops in corporate history. Expect $2500 or more. Of course for a quadcore with single lowend FirePro. That would be as low as I'd expect, though under $2K would be even better. I thought that it said that the Mac Pro will always come with two GPU's. I thought that it said that the Mac Pro will always come with two GPU's. It's shown with only a single HDMI port which makes me think this is not that graphically powerful. Even if you could have a powerful graphics chip or 2 and still only offer a single output, it wouldn't make sense to do so. Makes me think that graphically this is not that strong. It got 6 Thunderbolt ports - and part of Thunderbolt spec is... Mini DisplayPort. So it got plenty of outputs. It is an impressive bit of integrated mechanical-thermal design. At full load, I'm sure it has to whoosh, but perhaps that blower is designed for a smooth broadband sound. A smooth, non-tonal 25 [email protected] isn't objectionable, imo. As long as the fan controller has enough hysteresis to keep it from yoyoing up and down. They mention that they will be offloading as much of the calculations to the GPU's. This makes sense for some things (similar to [email protected]) - and I think I read that OSX will be programmed to use the CPU (up to 12 cores!) or the GPU's; whichever is most appropriate. The Mac Pro will support 3 high resolution monitors, according to the information in the release. all it needs now is metro. they used to make heatsinks out of a single piece of al. why did the aftermarket abandon this? Apple claims 12dBa at idle. Anandtech liveblog...a little less than halfway down. 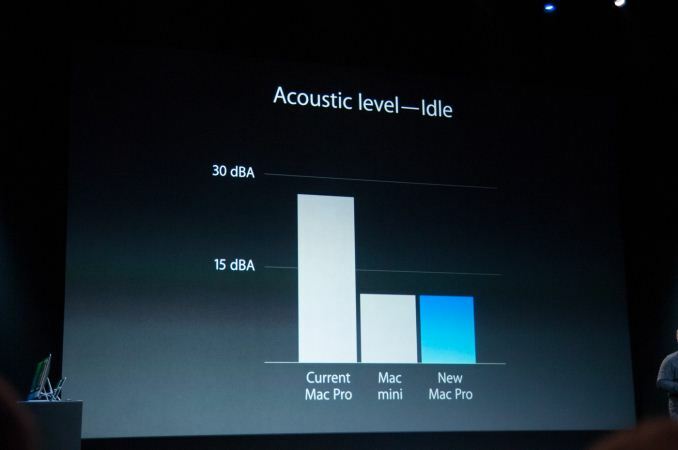 We'll have to wait until December to find out how loud it is at load. I think the main material used in this computer is aluminum? Sure, it's got a single CPU, but it has up to 12 cores, and up to 64GB of system RAM. It has dual internal GPU's with up to 12GB video RAM total, and supports up to 3 high resolution screens, so who needs an external video card? I agree that it is not perfect, the cable salad is one point, and the lack of a optical drive is another. But the focus on simple and effective cooling is commendable. They are claiming 12dBA at idle and the graph looks like under 20dBA (18-19?) under load.